Good morning! Just wanted to post a few more details for the Chick-fil-A Bowl. If you are attending the bowl, please read this email completely a few times to digest this information. Since we will not wear our shakos for the performance and not have great access to the bus after the parade, WE WILL NOT WEAR SHAKOS or PLUMES in the parade. Students are permitted to wear a school colored beanie (black/gold) during the parade and pre-game performance if they’d like. Collegiate colors will not be permitted, we must represent CHS. We will NOT need all of the regular chaperones for our travels on Sunday or Monday because we are only traveling on 4 buses. Ms. Walker has contacted the chaperones today. If you are needed for Sunday, then you should have already been contacted. The same goes for Monday. I appreciate everyone’s help in making this successful for our students! If you would like to drive your personal vehicle to the parade and game, you are welcome to do so. You will be responsible for your own parking, but there are many facilities around the Mercedes Benz Stadium that would be convenient for you. This will allow you to not have to spend your full morning downtown and provide you with a little more freedom with leaving the game. If you are a parent riding the bus, you MUST follow our itinerary. Please be early! If a parent is running late and is holding up the students, then they may miss the bus. I do not want this to happen to anyone, but we are traveling to this event for our students to participate in the bowl game festivities and our students itinerary does not have any wiggle room. We must following our itinerary closely. Any parents riding the bus to the parade will remain on the bus after we drop the students off for the parade staging. You will ride the bus to the where our buses will be parked, which is closer to the end of the parade route. Use the map below to find your way to the end of the parade route. You will be able to see the new stadium from where our buses are parked. WHERE TO MEET FOR TICKETS: ALL adults attending the game MUST meet Mr. Carr and the band at the end of the parade. All tickets for admission will be distributed at the end of the parade, which includes your admission to Fanfest. We will all enter the Fanfest area (the Big C on the map above) after the parade. Students will bring their instruments with them to Fanfest and we will have a designated area to store our equipment temporarily. Since this room will be shared with other bands, I will need parents to rotate shifts in this room to keep and eye on our equipment. HOW TO ENTER THE GAME: About 10:50AM we will exit Fanfest to enter the game. Parents will exit one way and students another but must stay with their respective groups. 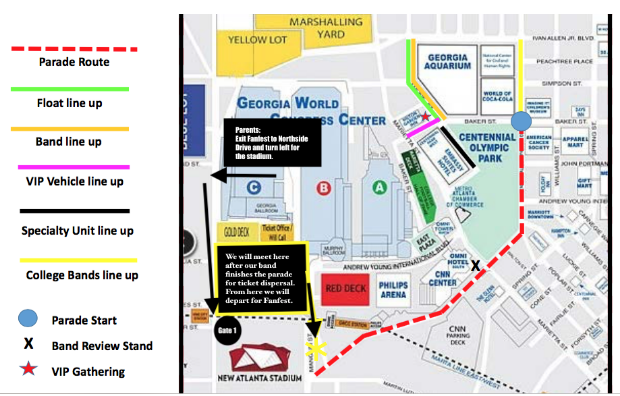 Parents will exit Fanfest (big blue C on the map above) onto Northside Dr. The Benz is just up the street to the left. Enter the stadium through Gate 1. Gate 1 is the first Gate that you will encounter and the ONLY gate that your credential will allow you to enter the dome. You should arrive around 11:00AM – 11:15AM. Tonight they mentioned that kick-off has been moved up to 12:40PM, which means that pre-game has also been moved up. Students will follow Mr. Carr to the loading area of the Benz since we must enter on the field level to prepare for our performance. SCALPING YOUR TICKET will result in arrest. If you are unable to use your ticket, I am sorry, but you cannot resell it. We have special credentials that will only be honored at this particular gate during a specific time. 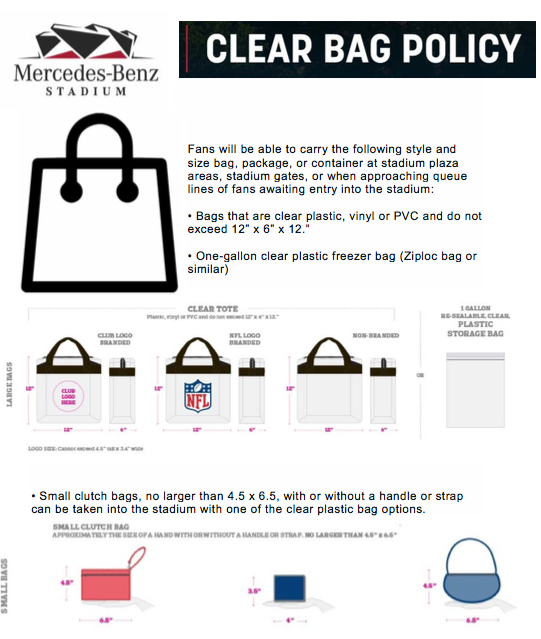 Be aware that the Mercedes Benz Stadium has a CLEAR BAG POLICY – which is listed below. Students will not be permitted to bring a bag since we will be entering straight to their performance and not have a chance to visit the buses between dropping off for the parade and the game. Thank you for agreeing to attend this awesome event with our children. We may need your help loading/unloading instruments, supervising students in the stands. Please be prepared to assist with loading instruments, escorting kids, etc. It will be COLD! The massed band rehearsal tomorrow will be outside the entire time. Dress in layers so that you will be warm. Also, the parade morning will be very cold – color guard students need to wear extra layers of appropriate undergarments to stay warm. Additionally, they will need a coat to keep warm before we step off. A wagon with their jackets will be pulled so that they are able to perform in their uniforms, and so that they have quick access to the jackets when we are finished with the parade. 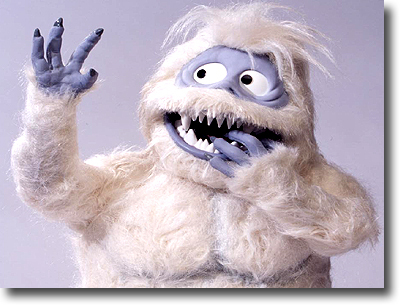 Parents and students – take note: It will be cold – we do not want you to be miserable dress warmly. We leave very early Sunday for the mass band rehearsal and don’t have a lunch break until after 2 pm. Please pack a snack for the bus if you think you will need it. We will have granola bars and pop tarts at the band room that morning, but please also eat a sensible breakfast before arriving. After the rehearsal we will attend the Varsity for lunch. Bring at least $10 for lunch. The day of the game eat breakfast before reporting for the parade. We will be in Fanfest before lunch time and students will have the option of purchasing food inside Fanfest and again once inside the Mercedes Benz Stadium. Sources have told me that food prices are reasonable (not your typical arena prices) in the new stadium. I would still recommend just to be safe to have about $20 for lunch and a snack while at Fanfest and the game. Posted in CHS Band and tagged #trojangold, #trojansallin, Carrollton High School, Carrollton High School Band, Carrollton Trojan Band, Chick-fil-A Bowl, CHS Band Program, CHS Trojan Band, Gold Standard, peach bowl on December 30, 2017 by CHS Trojan Band. I hope that everyone had a terrific Christmas yesterday and is enjoying some much needed time with family. Times like this allow us to reflect on the many blessings in our life. Thank you for being a blessing to our band program. I published the list of students who signed up for the Chick-fil-a Bowl on Google Classroom today. I didn’t want to publish it publicly. Your child should be able to access this – if not then please send me an e-mail at christopher.carr@carrolltoncityschools.net and I send you the list. It is important that this list is accurate. I had to order these tickets back in November, which is why the deadline was so early. If your child made the commitment, they need to honor it because we are counting on them. If they did not make the commitment at that time, I unfortunately am unable to get them a ticket at this point. Emergencies however do happen, so if your child is interested, please send me an e-mail and I will put them on a waiting list. I would like to use 100% of the tickets that have been purchased for us. Mass Band Rehearsal – 12/31/2017: Students should have the Star Spangled Banner (in Ab Major), Bruno Mars Medley, and Treasure memorized for this rehearsal. Students should bring a copy of their music for reference just in case. 6:45AM Depart for the massed band rehearsal at Woodward Academy This will be outside and may be very cold. Dress in warm layers. 6:15am in Uniform – wear layers it’ll be COLD. Posted in CHS Band on December 26, 2017 by CHS Trojan Band. Just wanted to share this bit of extraordinarily happy news from Mr. Huls. Although Mr. Huls now works at McEachern HS, he is still a Trojan at heart and today we celebrate with him and his family. Announcing Owen Adam Huls (“B”) and Verity Rose Huls (“A”) born this morning! What a beautiful family! Henry is on his way to visit with his brother and sister. Congratulations, Mr. Huls! We love and miss you and are so HAPPY for you! Posted in CHS Band on December 19, 2017 by CHS Trojan Band. I hope you have all enjoyed the snow, family time, and now an extra day off! Due to the inclement weather and continued hazardous conditions, school is closed on Monday, December 11. All after school rehearsals have also been cancelled. The dress rehearsal for the concert has been rescheduled for Tuesday after school. Please bring $5.00 for dinner – we will feed you between the rehearsal and the concert. Please note, District Honor Band auditions have been rescheduled for Saturday, December 16th. Students who have signed up for District Honor Band have auditions on Saturday, December 16th at East Paulding High School. Our scheduled time is 1:00PM. Students should arrive by 12:30PM to register and warm-up before auditioning. Auditions will be listened to on a first come, first served basis. So once you are finished warming up, please report to your assigned room and get in line for your audition. Judges are at lunch from 12:00-1:00, so if you arrive at 12:30 and warm-up, you should be able to get in line around 12:50 and be one of the first to audition after lunch. Tuesday Night is the Christmas concert on December 12th at 7:00 pm in the Mabry Arts Center. This is sure to be a festive and fun evening. We are sharing the concert with our choir and drama departments. Make plans to be there and tell your family and friends to join us as well! Students should bring their concert attire to school with them. We will have rehearsal right after school before the concert. Students should bring $5 for dinner. We will order food for everyone and have it delivered so that students have an opportunity to eat before the concert. Students will not be released to go home before the concert, so please plan accordingly. Attire for the concert is our formal concert attire and a santa hat. If you ordered embroidered items from the Shoppe, you will be contacted individually when items are ready for delivery. Any items that are ready by Tuesday evening will be available prior to the Christmas concert in the lobby of the MAC for pick up. If you have already been contacted, please stop by and pick up your order. Tentative delivery for sweatshirts will occur Wednesday from 3-6pm at the band room. All fulfilled embroidered items will also be available for pick up at that time, in case you have orders for both. More delivery details to come later this week. As the 2017 marching season comes to a close, we would like to take a moment to extend a huge THANK YOU to all who have supported our newest endeavor to raise money to support our band students this year! It would not have been successful without the support of our awesome band family. If you have any general questions, please make sure to contact Mr. Carr at: christopher.carr@carrolltoncityschools.net, the Band Office at 770-834-0550, or the Band Boosters at: chstrojanbands@gmail.com. Posted in CHS Band and tagged #trojangold, #trojansallin, Carrollton High School, Carrollton High School Band, CHS Trojan Band, Gold Standard, Trojan Band Shoppe on December 10, 2017 by CHS Trojan Band. It’s beginning to look a lot like Christmas (and district honor band)! Don’t forget that the parade route will be different! I would also like to thank those that decorated the 18 wheeler! You guys rock! Students who have signed up for District Honor Band have auditions on Saturday, December 9 at East Paulding High School. Our scheduled time is 1:00PM. Students should arrive by 12:30PM to register and warm-up before auditioning. Auditions will be listened to on a first come, first served basis. So once you are finished warming up, please report to your assigned room and get in line for your audition. Judges are at lunch from 12:00-1:00, so if you arrive at 12:30 and warm-up, you should be able to get in line around 12:50 and be one of the first to audition after lunch. Coming up soon is the Christmas concert on December 12th at 7:00 pm in the Mabry arts center. This is sure to be a festive and fun evening. We are sharing the concert with our choir and drama departments. Make plans to be there and tell your family and friends to join us as well! ONLY 2 DAYS LEFT TO ORDER! Just in time for delivery prior to Christmas break. New hoodies and crewneck sweatshirts, including a new design for both our COLOR GUARD and Trojan Band with additional YOUTH sizing options added for our Trojan Band hoodie and crew! Deadline for all orders available for delivery before the Christmas break is December 5, 2017. Don’t miss it! All order forms are now available at the Don Hall Band Room display, as well as the Carrollton Middle School concert Monday, December 4, 2017, and the Carrollton Junior High School concert Tuesday, December 5, 2017. The Trojan Band Shoppe will be in the lobby of the Mabry Performing Arts Center for both events. 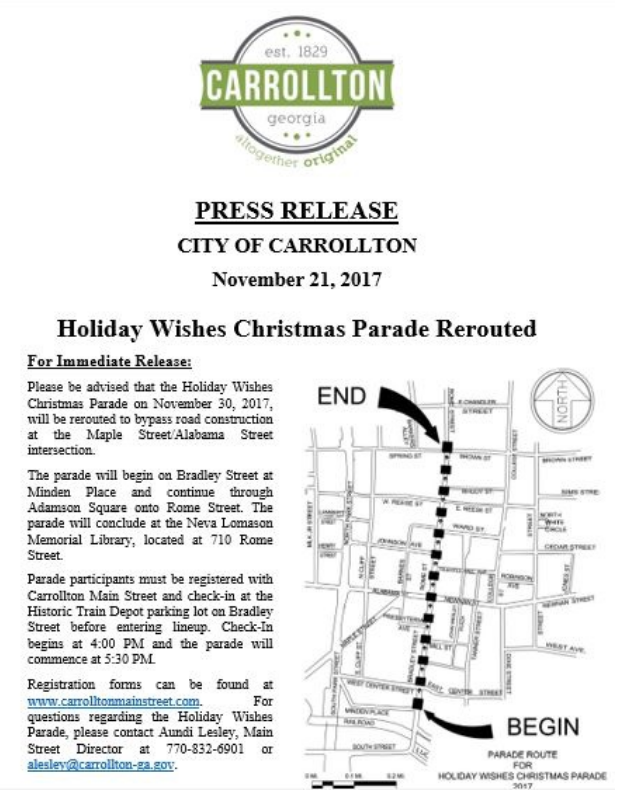 Posted in CHS Band and tagged #trojangold, Carrollton Holiday Wishes Parade, CHS Band Program, CHS Trojan Band, Trojan Band Shoppe on December 3, 2017 by CHS Trojan Band. Band Signing Day May 7, 2019 at 2:30 pm – 6:42 am Senior Signing Ceremony in the Band Room. For seniors and their parents.